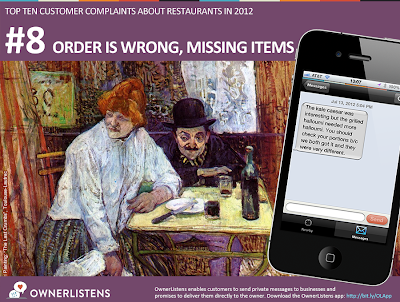 Top 10 Customer Complaints of 2012: #8 – Order is Wrong, Missing Items! 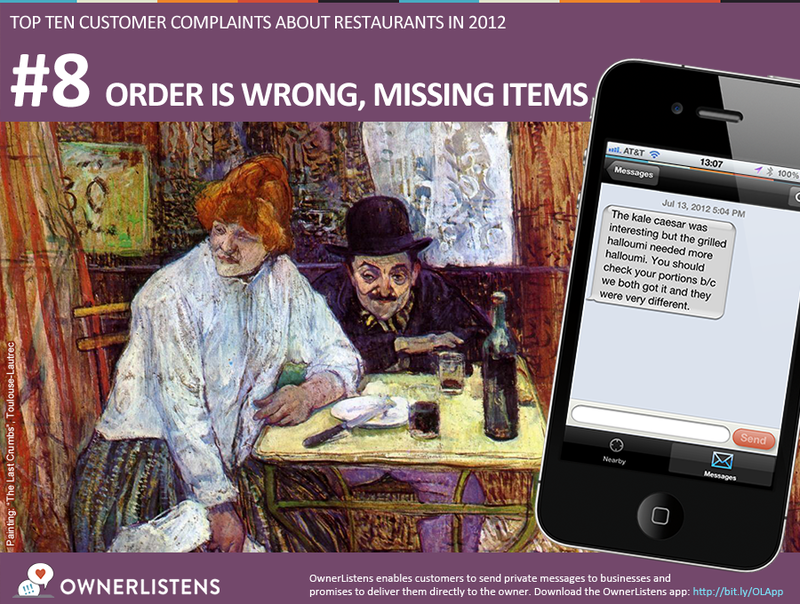 Welcome back to our series on the Top 10 Customer Complaints about Restaurants in 2012! To catch up on our countdown, check out the previous posts for #10 and #9! Missing items and incorrect orders are mistakes that almost every business encounters from casual counter service cafes to fine dining establishments. Perhaps the employee’s handwriting was poor, someone in the kitchen misread a ticket, or the server mixed up table numbers. In a business that relies on real people to provide your customer experience, there are countless ways mistakes like these can occur. One thing is certain: when a situation like this occurs, the customer is anything but pleased. This is a feeling we can all relate to as each of us have probably experienced this more than once from the customer’s perspective. Perhaps you felt this disappointment when opening your vegetarian sandwich during your short lunch break only to realize you will now have to miss lunch because you have a roast beef sandwich. Or perhaps you experienced resulting tension while on a special evening out where your date had to send an incorrect entree back and wait while you wrestle with the options of either letting your food get cold or rudely eating before your date has food – both of which take away from the great experience you once hoped to have. Looking into this issue in more detail, we have noticed something interesting from the owner’s side of this equation. When an owner addresses an incorrect order or missing items, the owner is often genuinely surprised at the situation! This is likely because most businesses strive for perfection in this arena and view problems involving incorrect orders as entirely fixable. The truth is, striving for perfection is great, but mistakes like these are still bound to happen; and correcting mistakes does not replace having a plan to deal with this situation when it does inevitably occur. Businesses should minimize the potential for this to occur and have a plan in place to deal with the customer efficiently and effectively when it does happen. Identify where orders have gone wrong in your establishment. Keep track of order mistakes by having your staff list them in a log book. Hold a meeting with your staff and openly ask where orders have gone wrong in the past without assigning blame. You may be surprised at how many different ways this has occurred. Reasons such as poor handwriting, lost tickets, table confusion, and a plethora of other honest human mistakes may come under discussion. Be open with this meeting and talk with your staff about ideas for how to minimize this going forward. Employ simple solutions to mitigate risk for incorrect orders. Common areas for improvement include: higher quality pens and paper used to take down orders, intuitive numbering system for table order, notation standards for recording special requests for the kitchen such as omissions/substitutions, and visually check every order before serving – especially if it’s a to-go order. If you use a computer to log orders, make sure it is placed in an accessible area for your servers and encourage them to input individual orders whenever possible as inputting multiple orders simultaneously increases the risk for an incorrect order. Have backup plans for when orders go wrong. Make sure your servers know what they can do if an order is incorrect. For instance if you have table service, sending out a small plate or appetizer can resolve some of the customer’s feelings and buy you time to correct the mistake. Communicate with the customer immediately and compensate when appropriate. You should have a system in place to communicate with the customer about the issue. OwnerListens is perfect for this as you can communicate with the customer, apologize for the situation, and even offer compensation whether the customer is still in your restaurant or at home. Sign up now if you haven’t already. Continue to learn and improve. Take time out every few weeks to reexamine how your business is doing with respect to order accuracy and repeat these steps every so often. Over time, you can continue to perfect your process and improve your customer experience. Business Owners – Have a technique or solution for common issues that you’d like to share? Tell us here in the comments! Consumers – experience an incorrect order recently? Tell the owner with the OwnerListens app so they know how they can improve!